I'm a little jumpy today. Money is on my mind. I have not so much at the moment. I'm down to $99.72 in checking and $5.73 in savings. I filed for unemployment again a couple weeks ago. I know that I qualify but it seems that my online application was lost. It might be awhile until the issue is resolved. With my husband's help, I'll juggle it somehow but I'm so over scraping by. It helps to see the actual dollar amounts in my accounts. It's easy for me to get lost in a fog of financial denial. I spent 10 minutes looking at boots on Zappos this morning. It was cold, felt a little like fall for the first time this year. Made me think about brown boots. 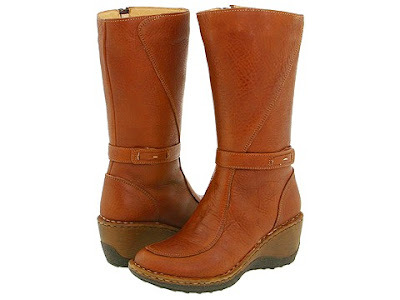 These babies in cognac are the frontrunners, on sale for a mere $92.80 (hey, I think I have just enough). I forced myself to close the laptop and walk away. I've made some mistakes over the last couple years, incurred a little debt. I've gotten out of debt before but have just been treading water on my situation for the last several months. I feel a great amount of motivation to try a new endeavor. Talking over a couple ideas for something commercial with my brother . . . maybe a blog. Lucky for me, he's a software engineer and he's willing and ready to help but I'm hesitant. Seriously never doubted myself in the career sector. Now, I'm a specialist in career self-doubt. But it's not an unusual situation in this day of foreclosures and unemployment extensions. Got to set the stress aside so I can think it through. Can't sit still any longer to write though. Need to keep moving. Helps me think.